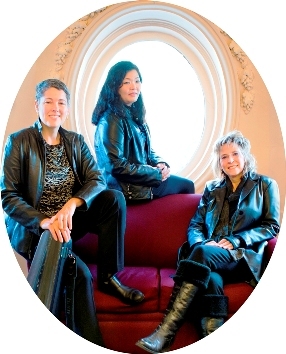 Strings Theory Trio: CD Release Concert of directed improvisation composed and performed by Mimi Rabson, Helen Sherrah-Davies, and Junko Fujiwara.Wednesday, January 28, 7:30 pm. Free and open to all, free CD to first 20 guests. David Friend Recital Hall, 921 Boylston St., Boston 02115. For information: 617-710-5932, www.berklee.edu/events/strings-theory. Combining idiomatic flexibility, a deep wellspring of creativity, and world-class virtuosity, violinist Mimi Rabson is one of the Boston area’s most valuable musical resources — and her new recording with her Strings Theory Trio is a uniquely compelling synthesis of classical chamber music and directed improvisation, bringing together some of Rabson's most important influences and inspirations. With Rabson and Helen Sherrah-Davies on five string violins and Junko Fujiwara on cello, the Strings Theory Trio supercharges the intimate atmosphere of chamber music with a triple dose of edgy, daring improvisation. The listener is treated to experiencing Western classical tradition anew; the surging counterpoint and crystalline instrumental sonorities gain new resilience and allure from their origin in the inspiration of the moment. Simultaneously delicate and dangerous, the Strings Theory Trio’s music is richly nuanced and deeply satisfying. A sample of their new recording project can be viewed at www.vimeo.com/soamel/stringstheoryflashback. Mimi Rabson (www.mimirabson.com (http://www.mimirabson.com/mimirabson.com/Welcome.html)) has played in more varied contexts, styles and venues than most performers can even imagine. A first-prize winner of the Massachusetts Cultural Council Fellowship in composition, her compositions and arrangements include arrangements of music by Duke Ellington, James Brown and Cole Porter as well as her own originals; her music and articles appear frequently on the pages of Strings Magazine. She has appeared on “The Late Show with David Letterman,” performed with Itzhak Perlman on the recording "In the Fiddler’s House,” and was featured in "A Jumpin' Night in the Garden of Eden," a documentary film about Klezmer music. Rabson served as musical director for academy award winner Joel Grey’s production of “Borschtcapades ’94.” Her composition "Klezzified" was featured on Saturday Night Live. RESQ (aka Really Eclectic String Quartet), founded by Rabson, performs her original compositions in addition to her arrangements of jazz, funk, fusion, gospel, and Latin music. RESQ has produced two recordings: “The Really Eclectic String Quartet” and “To the RESQ.” A founding member of the Klezmer Conservatory Band, Rabson worked with that organization for many years, touring as well as recording, composing, and acting as their musical director. Other performance credits include: the premiere of “Fresh Faust” by Leroy Jenkins; the soundtrack for "Sensorium”, the award winning film by Karen Aqua; and appearances with Stevie Wonder, Robert Plant and Jimmy Page, Meatloaf, Kristin Chenoweth, the Boston Gay Men's Choir, the Boston Camarata, the New England Ragtime Ensemble, the Klezmatics, Deborah Henson-Conant, the Pablo Ablanedo Octet, and XLCR. She has twice performed on “A Prairie Home Companion," and has appeared at Avery Fisher Hall, Lincoln Center Out of Doors, Wolf Trap, the Mann Center, the Place des Arts in Montreal and other international venues. Rabson is currently on the faculty of Berklee College of Music. Junko Fujiwara (www.junkocello.com)is both a creative musician/improviser and an active classical player performing in varying venues throughout the East Coast and the Midwest. Her current performing groups include: BOLT: Adventurous Improvised Music, the Mimi Rabson Trio, the Eric Hofbauer Quintet,Evocation Trio, and the Di Evano Project. Fujiwarais also a member of the Kalliope Piano Trio and a semi-regular performer with the Metal & Glass Ensemble. She holds cello faculty positions at Boston College, Governor’s Academy, Masconomet Regional Schools, Ipswich Public Schools, and also maintains a studio of private students. Fujiwara is also affiliated with the Northeast Massachusetts Youth Orchestra, where she coaches chamber groups. Fujiwara holds degrees in music from Northwestern University and Lawrence University in Appleton, Wisconsin. Helen Sherrah-Davies (www.helensherrahdavies.com), a native of Britain, is a graduate of both Berklee College of Music and the New England Conservatory. International credits include recording with Herbie Flowers (Sky/T Rex) in the UK, performing with Jon Lord (Deep Purple) in Switzerland, at the wedding of “Posh Spice” to David Beckham in Ireland, Montepulciano Opera Festival Orchestra in Italy, and recently at an International Music Festival in the West Bank, Palestine, also teaching at Al Kamandjati in Ramallah. Stateside credits include performing with Simon Shaheen, with the Arabic Fusion ensemble, ZilZala, Mimi Rabson’s Power Trio Project, singer song-writer Alan Williams’, “Birdsong at Morning” and the J Way Jazz String Quartet. Summer 2012 saw her explore microtonal notes between “the notes” with monster guitarist Dave “Fuze” Fiuczynski’s unique “Planet Microjam Institute” at the Jazz Festival in Genoa, Italy. Sherrah-Daviesis currently on the faculty of Berklee College of Music.